Children can experience many different foot problems. 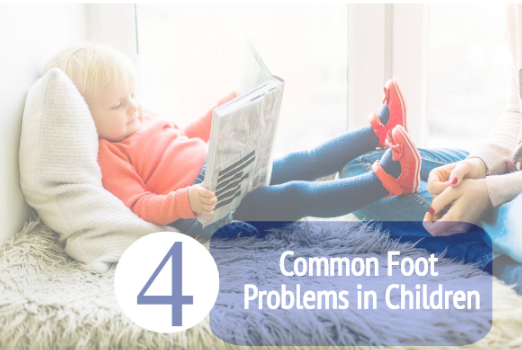 Although many children experience foot problems, they can be hard to detect. Some children may be too young to be able to tell you about the pain or they don't want to tell adults because they will be forced to sit down or stop their activity. Also, children are very active and can suffer from a number of injuries. Heel pain is the most common foot problem we treat in the office. Heel pain can affect all types of people. Everyone from busy adults, active seniors, and children can be susceptible to heel pain. Heel pain is most commonly caused by plantar fasciiitis which is an inflammation in the plantar fascia tendon. Children are still growing so their muscles and tendons can become tight during growth spurts increasing their chances of heel pain. Children, especially younger children, will almost never complain that "their heel hurts." they may complain that their feet hurt or it hurts to walk. In addition, if your child begins to sit out of sports or their favorite activities, they may have pain. Ingrown toenails are common in children for a number of reasons. to start, they are more common in teenagers which may be due to their tight, constricting shoes. The most common cause of ingrown toenails is not cutting the toenail the right way which could be why independent teenagers seem to get more. Ingrown toenails can be very painful and tempting to try to resolve quickly by yourself. Never use tools, or allow your kids, to use tools to try to correct the toenail. Without proper treatment, ingrown toenails can become very painful and infected. in worst cases, surgery may even be required. Plantar warts are very common among children. Warts are highly contagious and children just love to share. Warts thrive in warm, dark and moist environments such as pools, locker rooms, and shoes. As children walk around barefoot, they care putting themselves at risk for warts. Preventing warts is simple- wear shoes as often as possible. Wear water shoes or sandals while at the gym and locker rooms. also, don't share shoes with friends! Lastly, be sure to wash your socks thoroughly. If possible, wear white, cotton socks you can bleach. Flat feet are also common in children. Flat feet is when the foot has little to no arches. On the contrary, high arches can also cause pain and problems, but flat feet is more prevalent in children. Many times flat feet will correct itself without treatment. If your child does not outgrow the problem and flat feet continue or if there is pain in the foot or calf, your child could need treatment. There are treatment options for flat feet. Orthotics are a great treatment options as they correct the foot and substitute for arches. the place the foot into the proper placement. Another great treatment option is HyproCure. It is a permanent solution for flat feet. Orthotics can only be used when your child is wearing shoes, while HyproCure is a permanent solution. If your child has foot pain or has begin to complain about their feet and withdraw from activities, you should see a doctor. Children are resilient and can overcome many problems if they're treated early. Foot problems in children that are left untreated can become very painful and serious problems as an adult. Our office treats children of any age! Our doctors are experienced to and skilled to handle all children's foot problems. If your child is dealing with foot problems, call our office to get them better, faster (732) 968-3833 or (908) 874-8030.